Was halfheartedly painting today. All I have to show for it is this pink version of my bicycle, which is red in reality (a Ruby Belle retro bicycle by ProGear, Melbourne.) 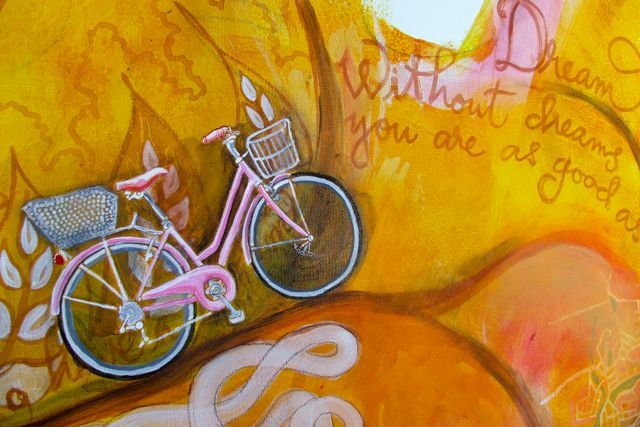 This is just a small detail from the larger painting Moulin D’or, which is coming along very slowly. I’m at that point where I don’t know what it’s about, or why I’m doing it, or whether each new thing that I add to the painting is right. Unsure about everything. Unhappy with everything. Ready to turn back. I know from the last painting that I have to push ahead, regardless of how I feel; I cannot expect to be happy with everything I do to this piece of canvas…especially not at the beginning. I never am. I need to get to that place Kafka refers to…the point where everything pulls together, and I’m not working blind anymore. The Golden Mill…grinding dirt into gold…spinning a dream. Was thinking about this visit I’m making to Malaysia, and how I’ve decided to take my bike along, and cycle from KL to Butterworth: 367 kms. I’ve never done more than 25 kilometers at one time…and here I want to do 367 in the equatorial heat of an unfamiliar Southeast Asian country? What started as a crazy idea has turned into intense longing. I really want to do this. It’s taking on the proportion of a dream. Not a massive, life-altering dream, but a compact, concrete and doable one. A dream with a definite goal, a finish line. It’s good to have a mix of small and big dreams…pepper your long journey through deserts of heroic effort with little oases dreams…like a rest and a snack before setting off again. I haven’t had many dreams in my life…at least not that I was ever aware of. I’m not a very ambitious nor competitive person. I’m actually really happy with who I am and what my everyday life is like—which can be a good thing—but it makes me pretty complacent. My parents seemed a bit scared to dream, and I think I’ve inherited that meekness. Nothing wrong with being happy with what I’ve got and where I am, but I think I should still be incubating a few little dreams…even if it’s just to find out what my limitations are when I hit a wall chasing the dream. After all, there’s just this one life (that I’m sure about, anyway)…this may be my only chance. The words scrawled to the right of the bicycle is Kris’s personal motto. “Dream. Without dreams you are as good as dead.” Kris has a zillion dreams. And he’s one of the few people I know who actually works methodically through the list. So I know that it’s not impossible and I don’t want to be the sort of person who talks, for the rest of her life, about the one big thing she did when she was in her 20s! Love your inspiring creation – cycling from KL to B’worth? I don’t really encourage that…#1 – road safety : accident rate quite high here! #2 – Highway don’t allow bicycle only motorbike accepted. #3 – Seriously : then you need to have the main road map! Oh dear, I’ll suggest cycling from B’worth to Kuala Perlis Jetty Point (North part of Malaysia) and ferry to Langkawi! I love your painting, the colors are beautiful together. Keep it up. I can’t wait to see what you paint next! I’ve just been looking around your lovely blog – and tutorial blog after being recommended to come here by PC of Meijo’s Joy. She’s right – you are very talented! I was wondering if you would be interested in being featured on a creative worldwide hop that I co-run each week. 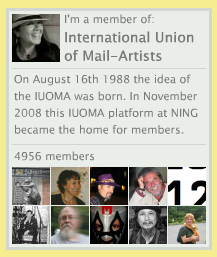 There are 5 hosts – one on each continent, and each week we feature someone creative from our corner of the world. (I am the Australasian host). The featured guest is ‘interviewed’ about their creativity – and you can add photos, links whatever you like to promote yourself and your work! If you would be interested then please let me know – I would love to feature you! 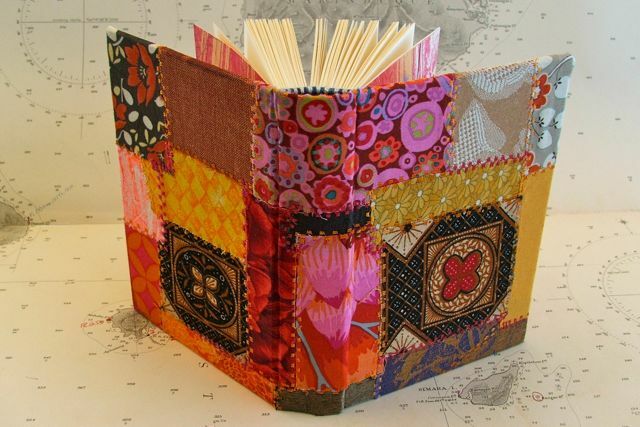 The patchwork journal is sumptuous! I love the deep rich colours and textures. As for the painting; I’m not an artist but I am a writer and there was something in what you were saying that made such sense about any sort of creative process. When I get to that point with my writing I look at the next point in the narrative or the article that I want to reach and blunder on to it. Then I walk away. Stick it in my subconscious and do something else. Usually by the time I come back I know whether I want to junk it or not. I just didn’t know Kafka had put it so much better! Yes, poor neurotic unloved melodramatic attention-starved Kafka! Yet he wrote well. He irritates me, though I respect him, too. Here and there, a line that sings. Nat, just have to say that I love the print. It’s so detailed! I can’t begin to imagine how much work went into doing it. 🙂 Funnily enough, I was looking at freezer paper stencils on the net the past few days and wanted to try them, but when I went to the store this afternoon, they didn’t have any freezer paper, so I went home a teensy bit disappointed. And then you go and post this! Great minds. Hee. Marnie, the internet is bad that way, makes you think you need a certain thing in order to move forward. Freezer paper is handy, but I can’t get it in Darwin, either…I’d have to order it online from down South. I used plastic book-covering material…the sort you buy in rolls at National bookstore. Get the cheaper, thinner kind, cuts easier. Use a very sharp new blade…x-acto is easier, but you can use the smaller size paper cutters, too. Make as many photocopies of the design as colors you intend to use. Glue them to the plastic with PVA so you can see the design through the plastic. Let it dry and then cut. The photocopies should peel off the plastic, afterwards, easily. Get an appropriately sized silkscreen frame. Lay the screen over the stencil, that way little bits won’t move and the stencil will lie flat. 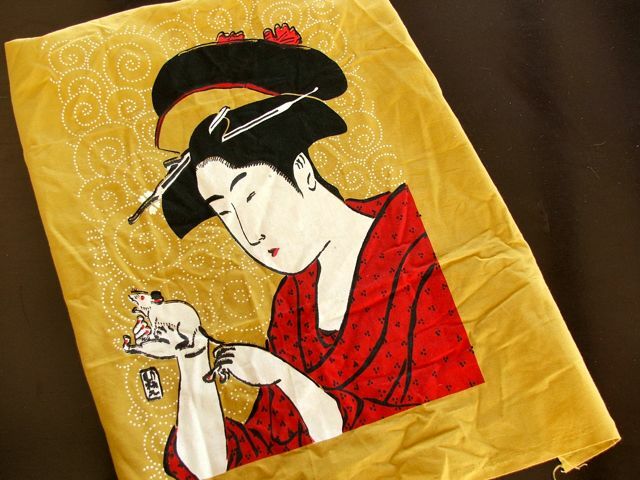 When you pull your first print, the ink will make the stencil stick to the screen, and you don’t have to worry that the stencil will fall when you lift the screen off the fabric. Haay naku, you awaken the teacher in me, once again I long to be by your side and do this with you. PM j=ko nalang yung sagot ko, re: on a more serious note. 🙂 Hugs, N.